Google’s Android 7.0 Nougat, the latest publicly available version of Google’s mobile and tablet operating system, is now running on 0.4 percent of active Android devices, according to the latest Google Play distribution data. The latest version has seen just 0.1 percent increase since November. Google has updated its Google Play distribution data for the seven-day period ending December 5. We can expect Nougat’s share to increase in next few months with several companies rolling out the Android 7.0 Nougat to their respective phones. In last few weeks, Huawei has confirmed that it will release Nougat update for select handsets in the first quarter of next year. Sony has already started rolling out the Nougat update to its high-end smartphones. Motorola also joined the league and rolled out Android 7.0 Nougat update to the Moto Z and Moto Z Force. HTC started pushing over-the-air update for its HTC 10 flagship smartphone. With Google rolling out Android 7.1.1 update, we can expect the version to make it to the list in the coming months. Sharing the latest distribution data of different versions of Android, Google reported that Marshmallow has a total share of 26.3 percent of Android devices that check into Google Play, compared to the 24 percent reported in November – an increase of 2.3 percent. 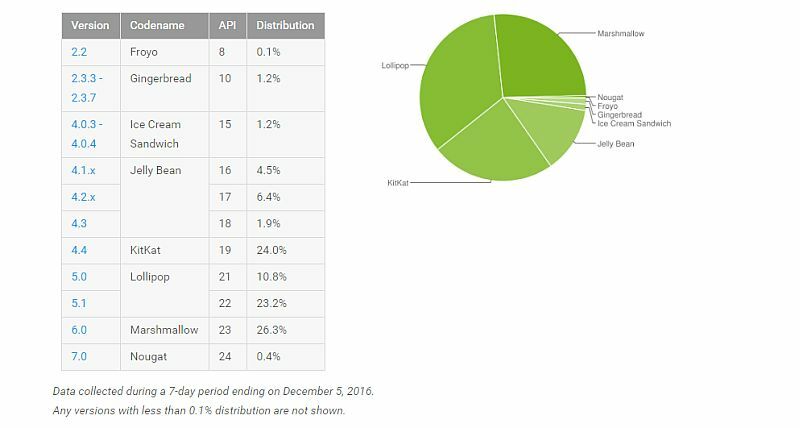 Based on December’s Android distribution numbers, Android 6.0 Marshmallow has become the most used Android version. In the latest data released by Google, Android Lollipop has a total share of around 34 percent of active Android devices (with Android 5.0 Lollipop running on 10.8 percent of devices and Android 5.1 Lollipop at 23.2 percent) that checked into Google Play. Last month, Android Lollipop was running on 34.1 percent of active Android devices. The Android Developers’ webpage shows that Android KitKat now powers 24 percent of devices compared to 25.2 percent last month – a decrease of 1.2 percent. Android Jelly Bean has a combined share of 12.8 percent while Android 4.0.x or Ice Cream Sandwich, in Google’s latest numbers, registered a share of 1.2 percent. Android Gingerbread (v2.3.3-2.3.7) and Android 2.2 Froyo’s device distribution shares are 1.2 percent and 0.1 percent respectively in the latest charts. To note, the figures are gathered from devices visiting the Google Play app, which only supports Android 2.2 and above. The latest OpenGL version distribution numbers, on the other hand, saw OpenGL 2.0 at 41.9 percent, and OpenGL version 3.0 steadily rising to 42.4 percent. How do we create a Quantum Internet?